Should be activated for normal operation. The display number and ports to use can be configured or set to Auto which defaults to Display 0, Port 5900and JavaViewer port 5800. The port is always Display No + 5900. Defaults to 5900 and 5800 for HTTP. Sometimes this could be helpful for tests. Normally it's not needed since the result is not very useful. Needed for tests. Connections from outside are not allowed. In a helpdesk scenario, you normally "Do Nothing" when disconnecting. When administering servers via remote control, you might wish to either "Lock Workstation" or "Logoff Workstation" for security reasons. If enabled, every time someone tries to connect via UltraVNC, a pop-up dialog informs the user and asks the user to either accept or refuse the attempt. Configure the timeout for the dialog window and what action should be taken if the user clicked no button until timeout. Some situations (e.g. presentations) require that either the viewer or the remote computer don't input keyboard or mouse events. This can be configured by "Disable Viewer inputs" or "Disable Local inputs". Here you can configure the behavior if multiple viewers attempt to connect to the same UltraVNC server. "Disconnect all existing connections" implies that only one viewer can be connected at a time and the last one wins. "Keep existing connections" allows for several viewers simultaneously. "Refuse the new connection" implies that only one viewer can be connected at a time and the first one wins. "Refuse all new connections" ?? "VNC Password" is a per-machine password and is required. Activates MS-Logon I. Works on Windows 9x as well as Windows NT4/2000/XP. Requires computer and user to be in the same domain. Activates MS-Logon II. Allows for cross-domain authentication, i.e. computer is in domain A, user in domain B with a trust between A and B (typically in Active Directory). Works only on Windows NT4/2000/XP. Opens the configuration dialog for MS-Logon authorization. For MS-Logon I there is a dialog allowing to configure 3 groups. For MS-Logon II there is the standard Windows Security property page. If there are any DSM (Data Stream Modification) Plugins available, their usage can be configured here. Currently there are several encryption plugins available. To reduce network traffic the wallpaper on the remote computer's desktop can be removed during the connection. Allow viewers to disable the monitor if they request so. Enable the UltraVNC File Transfer. Enable logging. 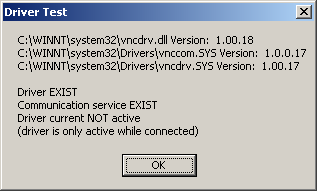 The log file is in C:\WinNT\system32 if winvnc runs as service. The logging level can be configured in the registry. The icon in the system tray can be disabled to disallow users to change any settings. Disallow users to close down WinVNC. Disable the "Properties" menu item in the system tray icon menu. Enable another method to disable the monitor. The server screen can be scaled down here. The "Properties" menu item in the system tray UltraVNC icon menu refers to per user settings. Provides DDI hooking, especially on Windows 9x. The video hook driver provides high speed and low CPU load on Windows 2000/XP/2003. Here you can test the video hook driver, see it's version and whether it's currently active. Get higher speed with reduced accuracy. Do not share the whole desktop but only the window with the specified name.